HOW LONG HAD I been building it? Seldom, I’d stop to ask myself that. It brought back only pain. Although that wasn’t strictly true. Shovel after shovel, I kept digging, barrow after barrow of gravel, I unloaded, truck after trucks of tarmac, I laid, all by my own rough calloused hands. Looking back, I saw only where I’d been, what I’d done. Looking forward I envisioned where I’d be, what I’d become, where I’d go. Fighting the influence of others, my very own road, travelled once, and never once more. No need for line painting, with one way traffic. Day after night, in any weather, I built that road. Maybe only an inch. 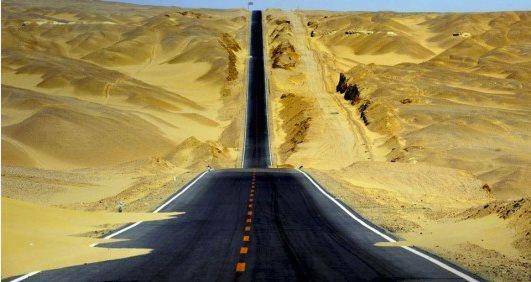 On occassion, miles at a time, the black slick followed me irrespective; in desert and hills, taking me wherever I wanted, asking only that I work it daily. Rains would threaten to wash it away, rarely following up on their promise. Earthquakes broke it into pieces. Never mind. Life would do that, and it would happen again. Undeterred I laid out that black slick, never stopping, never sleeping. One day I noticed another road coming closer to mine, rapidly, sure to collide, as if conjured from nothing. They grew closer with their road, and she was building it at one hell of a rate, till our tarmac was inches from touching. Dropping my heavily repaired shovel I went closer. “I want to join it!” she said smiling innocently. Dam nearly broke her heart. I busted this out my notepad first. Good writing, I enjoyed it. Cheers Mary 🙂 I just rolled with it on two sides of note book pages. Clever write, almost a poem, so concise and so strong.